The controversy swirling around Bitfinex makes it a risky digital currency exchange to get involved with. However, it’s one of the only exchanges that allows over-the-counter trading and margin trading. Bitfinex is one of the oldest and largest digital currency exchanges on the market and one of the few that offer margin trading functionality, multiple order types and over-the-counter trading. The fact that Bitfinex offers low fees to high volume traders is another feature of this exchange that has drawn in professionals and high net worth individuals. However, over the course of Bitfinex’s long history, it’s been plagued by a number of issues including glitches in early versions of its interface and a high profile hack in 2016. In addition, Bitfinex was recently subpoenaed by the U.S. Commodity Futures Trading Commission. Another ongoing issue with Bitfinex is that several of its leaders are involved with the controversial cryptocurrency Tether. Editor’s note: This article was updated to reflect the fact that Bitfinex recently “decided to stop serving US individual and corporate customers altogether.” Prior to that decision, US-based corporations were able to use the platform. More information is available here. API access for automated trading. Zero percent transaction fees for high volume traders. Not much is known about the leadership. Victim of a high profile hack in 2016. $10,000 USD minimum account balance required to perform transactions. Verification currently takes 6 to 8 weeks. Wire transfer is the only fiat withdrawal/deposit method available. What Can You Trade on Bitfinex? Aside from the basic facts, little is known about Bitfinex’s history. The exchange was founded in 2012. It is registered in the British Virgin Islands under the name iFinex Inc. The company also has two subsidiaries: Bitfinex in Hong Kong and BFXNA in the US. Bitfinex was plagued by bugs early on, yet quickly gained popularity mainly because it was one of the only digital currency exchanges that offered margin trading functionality. Other than a short AMA in 2015, the only full Bitfinex interview that’s available online is this one. In it, CSO Phil Potter responds to questions shortly after hackers broke into Bitfinex in August of 2016. Bitfinex’s leadership is an international team with members hailing from France, Italy, the Netherlands and the US. JL van der Velde – Co-founder / Chief Executive Officer. Though van der Velde claims to have 30 years of “international high tech industry experience,” not much specific information about him is available online. On his Bitfinex bio page, van der Velde claims to have co-founded “a number of IT companies,” but he does not specify their names. Raphael Nicolle – Co-founder. Nicolle is a freelance Ruby on Rails programmer who helped launch Bitfinex and then moved on to other projects in 2015. Phil Potter – Chief Strategy Officer. Before Bitfinex, Potter was an analyst at Bear Stearns, Associate Director at Morgan Stanley. Potter serves as the CTO of the controversial cryptocurrency known as Tether. Paolo Ardoino – Chief Technology Officer. In 2013, Ardoino founded Fincluster– a cloud-based system for managing financial assets. Ardoino is also a major Tether shareholder. Giancarlo Devasini – Chief Financial Officer. Devasini founded a number of computer hardware manufacturers in the early 2000s, but doesn’t appear have any specific experience in finance. Stuart Hoegner – General Counsel. Hoegner is an expert in cryptocurrency law and edited The Law of Bitcoin. Prior to joining Bitfinex, Hoegner worked in the Mergers & Acquisitions Tax Group at the Ernst & Young law firm. According to Coindesk, Bitfinex is entirely self-funded. The exchange has invested in several different security services, including ShapeShift and Netki. Here is an overview of how Bitfinex protects its customers’ assets. Bitfinex has not published its specific KYC (Know Your Customer) or AML (Anti Money Laundering) policies. However, the Bitfinex Terms of Service page does mention that Bitfinex follows AML guidelines as set out by FATF (Financial Action Task Force on Money Laundering), an international organization founded by the Group of Seven industrialized countries. The process the exchange uses to decide whether or not a token is legitimate is not clear. According to the Bitfinex knowledge base, Bitfinex runs through a “thorough assessment of the token’s development process” before it accepts new altcoins into its system. Like most digital currency exchanges, Bitfinex holds the vast majority of its assets in offline “cold wallet” systems that require multiple signatures. The hot wallet system holds 0.5% of the exchange’s assets. In addition, security consultancy Hacktive performs routine penetration testing. Bitfinex offers three 2FA (2-Factor Authentication) options: Google Authenticator, Twilio and Clef. Also, Bitfinex now offers Onion logons through its tor domain. In August of 2016, the price of Bitcoin took a nosedive after hackers stole approximately 120,000 BTC from Bitfinex. 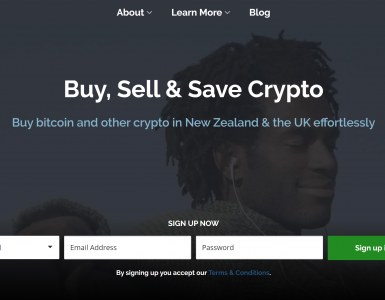 Following the attack, Bitfinex shut down, issued refunds and relaunched the site. CoinDesk criticized the exchange for trying to reach out to the thieves several months after the attack in an attempt to negotiate a deal. 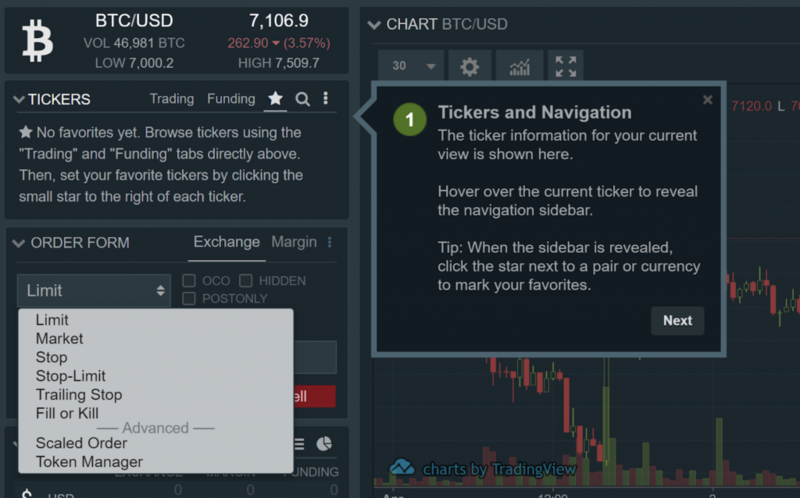 Even though Bitfinex is designed for advanced traders, its knowledge base features a number of easy-to-read walkthroughs. In addition, Bitfinex has a system status page and a blog. On the other hand, there is no live chat or phone support. Bitfinex is one of the most heavily criticized digital currency exchanges. Like all digital exchanges, Bitfinex ran into customer service issues in 2017 when the skyrocketing price of Bitcoin drew many newcomers into digital exchange markets. However, Bitfinex may not have responded to its critics in an appropriate way. In March of 2018, lawyer Stephen Palley of Washington, D.C.-based law firm Anderson Kill warned Bitfinex against threatening one of its most vocal critics. The critic– a blogger known only as “Bitfinex’ed”– has picked apart Bitfinex’s financials in a series of detailed blog posts. According to Bitfinex’ed, people associated with the exchange have offered a bounty for information about the anonymous blogger’s identity. In addition, authorities have expressed concern over the way that Bitfinex is conducting its business. In January of 2018, Bitfinex was subpoenaed by the U.S. Commodity Futures Trading Commission. Much of the drama around Bitfinex is centered around a controversial cryptocurrency called Tether. Initially, Bitfinex did not publicly acknowledge that it had any type of relationship with Tether. However, a recent leak exposed the fact that Bitfinex’s CTO Phil Potter was a director of Tether. In addition, Bitfinex’s CFO Giancarlo Devasini is still a major Tether shareholder. Residents of every country except the United States can use Bitfinex. 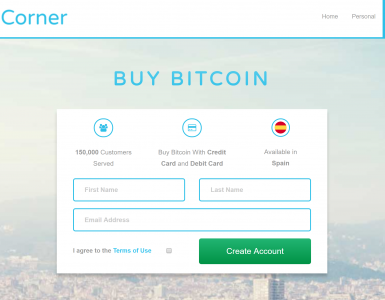 As mentioned above, Bitfinex no longer accepts corporate customers that are based in the US. Name & Contact Information – Information required to confirm account holder identity. Location – Information required to confirm location. Identity – Information for ensuring only you are capable of transacting on your account. Financial – Information required for bank wires and withdrawals. KYC – Information required by KYC/AML regulation. An ownership and control structure chart. A copy of the company’s bank statement. The Director’s minutes to open account. A current director register list. Proof of registered office and business address. In addition, each Director, major shareholder, control officer, and ultimate beneficiary must provide proof of identification. The following cryptocurrencies are available on Bitfinex: 0x, AidCoin, Augur, Aventus, Basic Attention Token, Bitcoin, Bitcoin Cash, Bitcoin Gold, Dash, Decentraland, EOS, ETP, Eidoo, Ethereum, Ethereum Classic, Ethfinex Nectar Token, FunFair, Golem, Iota, Litecoin, Monero, NEO, OmiseGO, QASH, Qtum, RCN, Ripple, Santiment, SingularDTV, SpankChain, Status, Streamr, TRON, Time New Bank, YOYOW, Zcash, aelf and iExec. Bitfinex supports four fiat currencies: JPY, EUR, GBP and USD. The Bitfinex interface displays what type of trade pairs are available when you hover over each available currency. To find out which trade pairs are available, open the Bitfinex demo and open the “Trading” drop-down menu. Also, the interface lets you place several different order types, including limit, market, stop, stop-limit, trailing stop, fill or kill, scaled order and token manager. A wide variety of trade pairs are available as well. Though the Bitfinex interface packs a lot of real-time charts into the dashboard, it was surprisingly quick and responsive when I tried it out. Interestingly, there are three different digital currency wallet types: exchange, margin and funding. The exchange wallet is for switching between any of the supported currencies. The margin wallet is for trading leveraged short and long positions. The funding wallet is for providing leveraged funds to other traders. The “trading” menu is intuitive, but it’s somewhat long and unwieldy since it contains every single currency available on Bitfinex. Available purchase order types include limit, market, stop, stop-limit, trailing stop, fill or kill, scaled order and token manager. The “OTC” section of the interface is for over-the-counter trades. However, you can’t access it unless you deposit $10,000 worth of funds into your account. Bitfinex has apps for iOS and Android. Both apps have decent reviews, but the iOS app is rated a half star higher. The main complaint about both Bitfinex apps is that they are slow to process purchases compared to the website. There is a 0.1% fee on all fiat deposits and the smallest amount of USD/EUR you can deposit is $20. The only deposit/withdrawal method available is wire transfer. There is no charge for cryptocurrency deposits worth $1,000 USD or more. 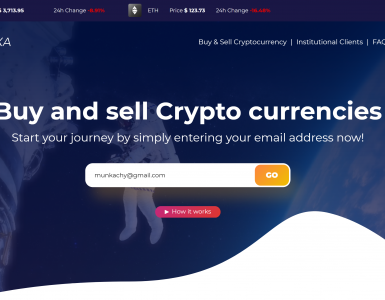 Smaller cryptocurrency deposits and all cryptocurrency withdrawals, however, do incur a small fee– but the fee varies depending on the cryptocurrency involved. 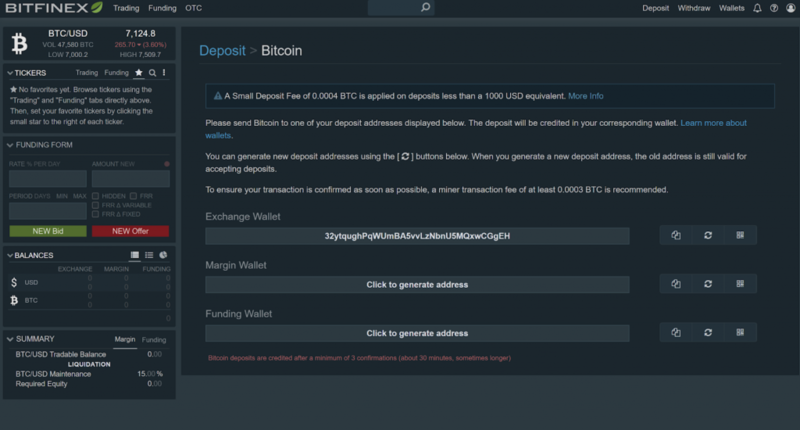 The withdrawal fee for Bitcoin is 0.0006 BTC and you have to pay the same amount in fees for deposits under $1,000 USD. Click here to see a full list of all digital currency withdrawal/deposit fees. On Bitfinex, your transaction fees can be as low as zero or as much as 0.2%. It all depends on how much money you’ve moved and whether or not your trade added or removed liquidity from Bitfinex. In addition to the standard Bitfinex transaction fee, there’s also a 15%- 18% fee on margin trades. Though Bitfinex’s interface seems to be much less glitchy than it was early on, it’s still very technical. In addition, the fact that Bitfinex doesn’t let its users link their bank accounts makes it inconvenient to use. Few other digital currency exchanges can match Bitfinex when it comes to advanced trading functionality. 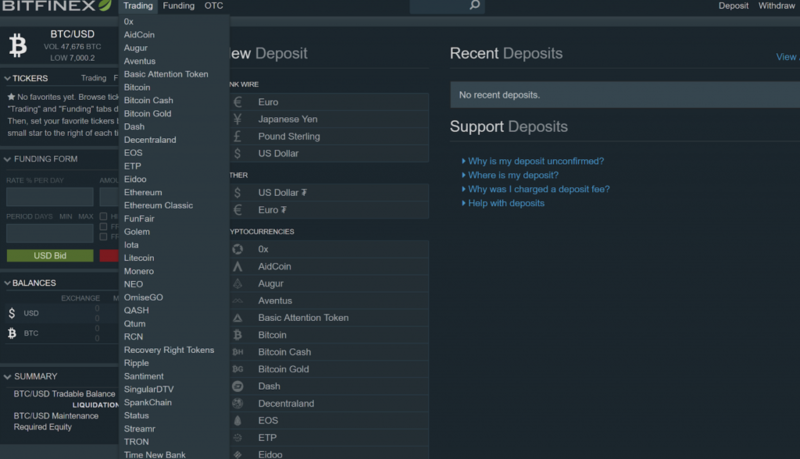 Bitfinex users can use the “funding wallet” feature to finance other users and trade on margin. A variety of different order types are available, including limit, market, stop, stop-limit, trailing stop, fill or kill, scaled order and token manager.